UHC – What’s on Your Mind? If you have misplaced an item in Dawson Hall please stop by the Student Success and Advising Center, Room 112, Monday – Friday, 8:00 a.m. – 5:00 p.m. The next Experiential Learning scholarship deadline is February 12th, 2019. All students are encouraged to apply! More information and the application can be found on the Resources page. Not able to purchase tickets for the SEC Championship? The Tate Student Center is hosting a watch party available to UGA students with their UGA cards. Doors open at 3:00 p.m. and food will be provided. Go Dawgs! 7. UHC – What’s on Your Mind? Finals are approaching! 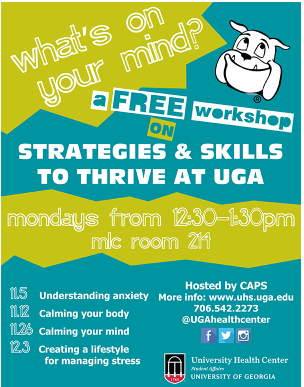 The University Health Center will be hosting free workshop strategies and skills to cope with things like anxiety and stress. This event will be held on Mondays from 12:30 p.m. – 1:30 p.m. For more information, please visit the UGA Health Center website! About China! This program not only allows students to earn class credit, but students also have the opportunity to experience a beautiful city! The China study away program happens within 13 days during the Maymester. During this time, students will tour China’s industry of clothing manufacturing. Students will also be visiting global sourcing companies, apparel manufacturers, designer showrooms, and major Western fashion brands’ flagship stores. This program gives students the hands on experience needed for fashion merchandising and for building a brand. This program is filled with opportunity you don’t want to miss! Class Credit! Students are able to earn 3 hours of class credit from May 11th – 25th. To see the list of the courses offered, please click here. Application! To apply, please visit the FACS China website or contact Katalin Medvedev . Scholarships! The deadline to apply for FACS Study Away scholarships is January 25th, 2019. Requirements and applications can be found on the FACS Study Away Scholarships website. 9. Get Involved With FACS! What is FDSA? The Fashion Design Student Association (FDSA) is a student run organization for fashion majors and those who share an interest in fashion design. This club not only gives students the opportunity to network and build relationships with one another, but students learn the skills needed to work in the fashion industry. Through events like the Signature Style fashion show, FDSA members will be able to design and exhibit their own work! This club is a great way to be more involved within your major! Benefits of Becoming a Member! Through FDSA, students are able to gain an abundance of knowledge about the fashion industry. FDSA members will be able to build their resume as they interact with guest speakers and other students with design majors. Students also come in contact with firms seeking interns and full/part-time employees. Join! This organization is designated to students who major and have an interest in fashion. Dues are currently $20 a year. To become a member, please contact one of the FDSA officers! Already a Member? Be More Involved! Attending the FDSA meetings is a great way to stay connected with any upcoming events or guest speakers the club may have. FDSA holds club meetings Wednesday in Dawson Hall. FDSA also offers opportunities to display other talents besides fashion. If you have an interest in photography, journalism, and visual display this would be a great club to join! For more information, please contact one of the FDSA officers. 10. Follow Us On Social Media!